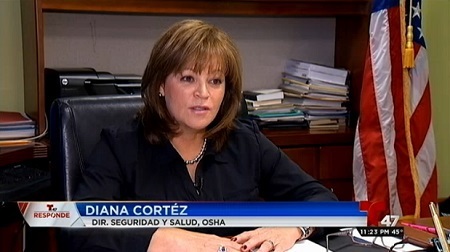 Following the death of a construction worker in New York, Channel 47 Telemundo recently interviewed OSHA Area Director Diana Cortez about worker rights and employer responsibilities. She outlined the mission of OSHA – to protect the health and safety of all workers in this country regardless of their immigration status – and mentioned that many Latinos work in the country's most dangerous industries. "Our goal is that every worker who works in the United States comes home safe," said Cortez. "And we do this through labor laws and workplace inspections." Cortez reminded viewers that employers must provide the right equipment and training to workers – in a language that they understand – to ensure their safety on the job. She also emphasized the requirement that employers must report any workplace death to OSHA within eight hours, and any serious injury or hospitalization within 24 hours. See the full interview in Spanish here. Last week, Deputy Assistant Secretary Jordan Barab provided the keynote address at a national conference of Veterans Administration hospital workers in Las Vegas. The conference, held by the American Federation of Government Employees, brought together representatives and partners of the host organizations to update and educate them on key and emerging occupational safety and health issues. Barab highlighted OSHA's ongoing work with VA hospitals and other healthcare facilities to combat workplace violence, including the release last year of Guidelines for Preventing Workplace Violence for Healthcare and Social Service Workers. He also discussed the agency’s efforts to ensure that OSHA inspectors have the resources, training and tools necessary to conduct inspections in response to workplace violence. "Care of our nation's veterans is a national priority, but we also have to look out for the health and safety those who care for them," Barab told the conference attendees. "Workplace violence remains a difficult and dangerous problem, particularly for those in healthcare settings." For more information, see OSHA's Workplace Violence webpage. On February 1, 2016, an Administrative Law Judge upheld OSHA citations and penalties against Royal Construction, finding that the company had control over workers on a jobsite. OSHA cited the roofing contractor of Canton, Conn., for seven violations of workplace safety standards at a Farmington work site in 2014. A total of $20,240 in fines was proposed. The company contested the citations, claiming that the workers at the job site were not employees but instead were independent contractors who worked under their own supervision, supplied their own tools and made their own hours. For more information, see the news release. Alpine Lake RV Resort was cited with nine violations and fined $187,000 after an OSHA inspection found workers were exposed to electrical hazards. The company, which operates a campground in Saratoga County, N.Y., required their employees to work on outdoor electrical equipment without appropriate personal protective equipment and safety training. Additional violations include exposing workers to live electrical parts and damaged electrical field boxes that were open to rain and wind, and failing to de-energize and lock out electrical equipment when workers tested or replaced equipment. For more information, read the news release. Copper wire manufacturer Tecnofil Chenango SAC in Syracuse, N.Y., has again been cited for exposing workers to potentially deadly or disabling injuries. An OSHA inspection found machine guarding hazards on die presses, saws, lathes and other machinery. Hazards included bypassing interlocks designed to stop machines from operating when their doors opened, failing to lock out machines' power sources before changing dies or performing maintenance; and failing to provide workers with adequate training. OSHA also found workers exposed to falls from unguarded work platforms, and slip and trip hazards. Tecnofil Chenango was cited with 17 violations and proposed $124,740 in fines. The company was cited in 2013 for similar hazards. Read the news release for more information. Four Florida contractors were cited and fined after an OSHA inspection found workers at a Jacksonville jobsite installing roofing sheathing without fall protection. The contractors are John Whigham Sheeting Inc., Ezzo Construction LLC, S.A. Robinson Construction and KB Home Florida LLC. Violations include failing to provide fall protection and exposing workers to falls up to 18 feet. The companies were collectively issued $144,830 in proposed fines. The inspection was initiated under OSHA's Regional Emphasis Program on Falls in Construction. Read the news brief for more information. North Carolina Occupational Safety and Health Division issued $151,900 in fines to Associated Scaffolding Company Inc. after three workers fell to their deaths at a Raleigh worksite. Inspectors found that scaffolding was not tied to the building according to the manufacturer's recommendations and that too much weight was placed on the scaffolding when it was being dismantled. The Arizona Division of Occupational Safety and Health fined Taylor’s Demolition & Recycling Inc. $21,000 and cited the company with three serious violations after one worker was killed and two injured when a wall collapsed at a Tucson demolition site. Inspectors found the company failed to instruct workers on regulations applicable to the work environment and how to recognize and avoid unsafe conditions. OSHA has ordered an Alaska aviation company to reinstate a pilot who was suspended, then fired for reporting safety concerns at work. Bald Mountain Air Services was also ordered to pay years of back wages and $100,000 in compensatory damages for violating federal whistleblower laws. The pilot for the Homer-based company raised repeated safety concerns at work ranging from missed drug tests for pilots to poor recordkeeping. For more information, see the news release. The Department of Labor has sued U.S. Steel to reverse disciplinary action taken against two employees who reported work-related injuries and to amend the company's reporting policy. OSHA found that the company violated the anti-discrimination provision of the Occupational Safety and Health Act when the employer used its immediate reporting policy as a basis for sanctioning employees who reported injuries "late." Both workers filed complaints with OSHA alleging that U.S. Steel had suspended them in retaliation for reporting workplace injuries. For more information, see the news release. After his foot broke through one of several deteriorated sections of flooring at a Buffalo, N.Y., demolition site, a laborer employed by Regional Environmental Demolition Inc. told his superiors of the serious hazard multiple times. In June 2014, after OSHA responded to an anonymous complaint, the company discharged him. The concerned worker then filed a whistleblower complaint with OSHA. The U.S. Labor Department has filed suit in federal court against the company for retaliating against the former employee. The suit seeks payment to the worker for lost wages and compensatory damages, interest, front pay, emotional and financial distress damages and punitive damages. For more information, see the news release. OSHA has updated its Whistleblower Investigation Manual to help employers, workers and their representatives understand the investigative process and how to request documents from OSHA during and after an investigation. The new material affirms that the standard for all whistleblower investigations is whether there is "reasonable cause to believe" that a violation occurred. The manual also provides guidance on disclosure requests under the Freedom of Information Act and the Privacy Act. OSHA enforces the whistleblower protection provisions of the OSH Act and 21 other statutes protecting workers who report violations of laws in various industries. In fiscal year 2015, OSHA helped award more than $25 million to whistleblowers across the country – a reminder to employers that workers have a right to speak up, without fear of retaliation, when they believe that their safety and health is at risk. Secretary of Labor Thomas E. Perez has appointed 15 members and a special agency liaison to the Maritime Advisory Committee for Occupational Safety and Health. MACOSH advises the secretary of labor, through OSHA’'s assistant secretary of labor, on issues related to safe and healthful working conditions in the maritime industry. These issues include safety and health standards, injury and illness prevention, training and outreach initiatives, and enforcement initiatives to improve the safety and health of maritime workers. For more information, including the names and affiliations of the new appointees, read the news release. The National Advisory Committee on Occupational Safety and Health will hold a special meeting March 4 in Washington, D.C., to make recommendations on OSHA's draft Safety and Health Program Management Guidelines. NACOSH was established to advise, consult with and make recommendations on matters including regulatory, research, compliance assistance and enforcement issues. The March 4 meeting is open to the public. For more information about attending the meeting or submitting written comments, read the news release. OSHA's Dallas Regional Office and the Association of Energy Service Companies renewed their alliance to improve the safety and health of workers in the oil and gas well-servicing industry. AESC, along with its member companies, will work closely with OSHA to continually improve and build upon existing training and educational initiatives, outreach and communication initiatives, and workplace health, safety and environmental initiatives. OSHA's Lubbock, Texas, Area Office and the West Texas Safety Training Center in Odessa renewed an alliance to increase awareness of employers’ responsibilities and to promote the rights of workers in the construction, general, and oil and gas industries over the next three years. "Since our alliance began more than eight years ago, West Texas Safety Training Center has been an excellent agency partner, communicating safety and health information to employers and workers in the petrochemical , construction and other industries," said Elizabeth Linda Routh, OSHA's area director in Lubbock. For more information, read the news release. OSHA and the Panhandle of Texas Chapter of the Associated General Contractors of America have signed a two-year alliance to focus on preventing exposure to fall hazards, the leading cause of fatalities in the construction industry; electrical hazards; and struck-by and caught-in-between hazards from vehicles, cranes and other machinery. For more information, see the news release.